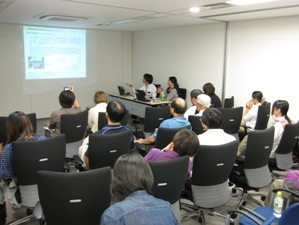 The 8th JRRN River Environment Mini Lecture was held on August 31, 2011. First, Prof. Kim gave a lecture on a national survey of the actual conditions of fishways, which has now been conducted in Korea, and efforts to build a database. 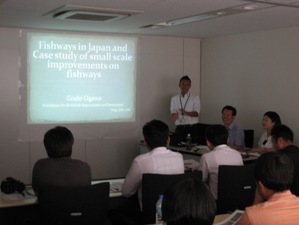 Next, Researcher Ogawa explained about the history of fishway development in Japan, the types of fishways, the state of installation in the country, and case examples of their improvement, showing various photos. 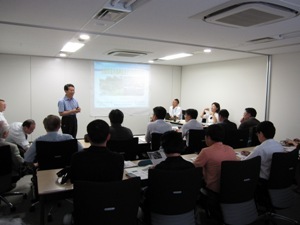 During the question and answer session after lectures, a lively opinion exchange was held among 8 members of a fishway observation team from Korea, including Prof. Kim, Instructor Ogawa, and JRRN members. 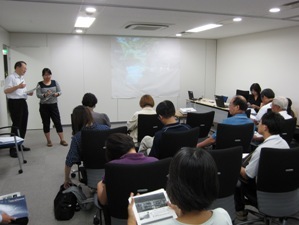 On August 26, 2011, an inspection delegation in partnership approach of river restoration (about 20 members) came to Japan from Taiwan, and had an exchange with JRRN. 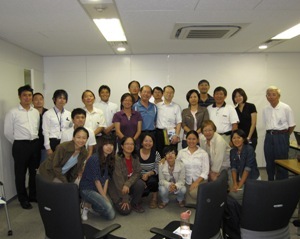 Delegation members consisted of community action groups involved in urban river restoration and community development in Taiwan, nationwide citizen’s networks, private enterprises, academic institutes, government officials, public interest corporations, etc.